Sunday turned out to be a really enjoyable day for CWH's 2009 Flyfest. I'm slowly working on the many pictures I took, but here are the first four. 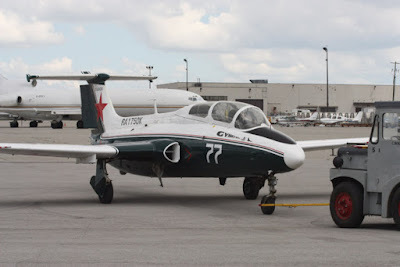 Martin Mattes's L-29 C-GXZX being towed out for its display. 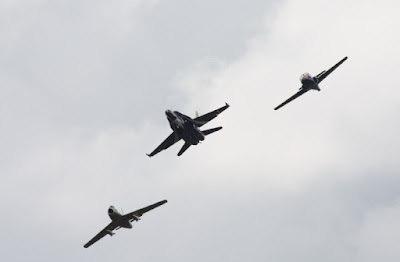 One of the major highlights of the day was the Centennial Flight consisting of the Hawk One Sabre, the Centennial Hornet, and one of the Snowbird's Tutors painted up as a Golden Centennaire. 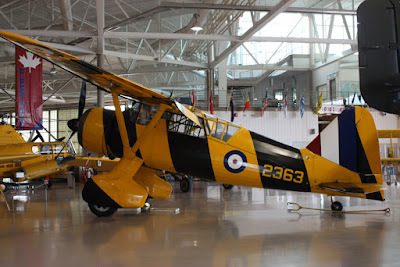 The other highlight of the day was the first public flight of the CWH Lysander RCAF #2363 C-GCWL after a 22 year restoration. She looks wonderful in her target tug markings. B-25 Mitchell C-GCWM "Hot Gen" made many nice passes throughout the day. I've seen pictures of the test shots and I've seen the box art, now here is the video. It all looks nice, but Airfix, could you just hurry up and release the kit! A few photos from Friday night and Saturday at Flyfest. Saturday was a total wash out. Hopefully Sunday will be better. 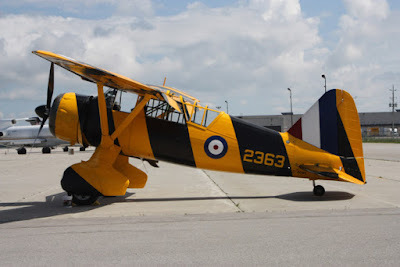 The CWH Lysander has finally taken to the skies in 2009. 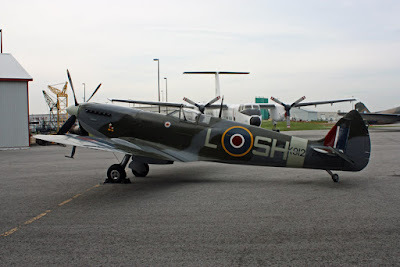 The Russell Spitfire showed up Friday evening. 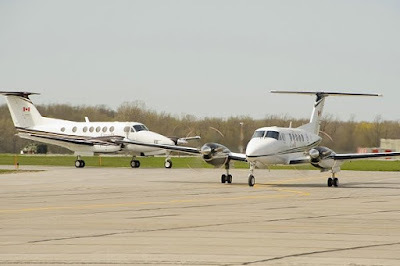 Saturday...what beautiful weather for flying. A CAF CT-155 Hawk on static display. The Buffalo restoration is finally complete. 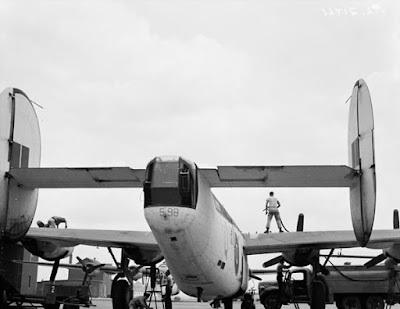 Markings are of a CAF Buffalo shot down in Syria in 1974. 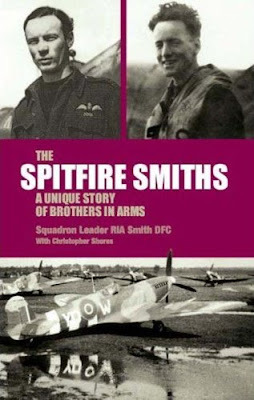 Subtitled "A Unique Story of Brothers in Arms," Rod Smith's part autobiography/part biography tells the story of Rod and Jerry Smith, two Canadian brothers flying Spitfires in World War Two. 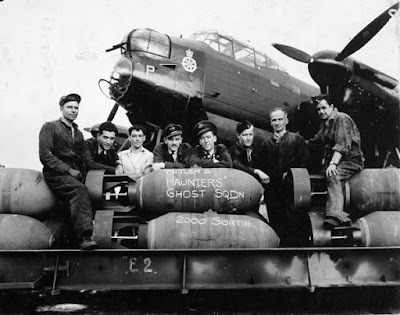 What is unique about the Smiths is that they served together flying fighters in Malta. The manuscript was started by Rod Smith, who tragically killed himself in 2001, and finished by Christopher Shores. In some ways this feels a little less satisfying, as I wish we could have got the whole story in Mr. Smith's own words, but clearly it is better to have the book finished by a close friend rather then not finished at all. As Jerry was killed in Malta in August 1942, his story is told by Rod and by excerpts from his diary. 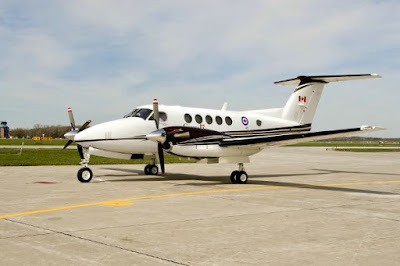 Rod's completed chapters make up most of Part One of the book, include his and Jerry's early life in Saskatchewan, training with the British Commonwealth Air Training Plan, early operation in Europe, and of course operations in Malta. One of the most "interesting" chapters is Rod's evaluation of military forces in Europe in the 30s and early 40s. While Rod is certainly qualified to discuss these matters, from his writing he seems a rather precocious teen who is more cognizant of air power and aeronautical development then many of the adult commentators and politicians of the day. Of course, Jerry Smith will be forever known as the first Spitfire pilot to land aboard an aircraft carrier after his auxiliary fuel tank malfunction and rather then crash into the drink, decided to take the chance and land on the USS Wasp. 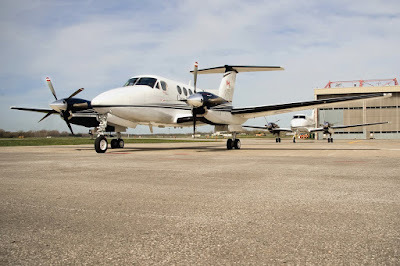 Jerry clearly made the correct calculation and arrived on Malta safely a day later. The book includes a few photographs of this event, that will continue to confuse modelers as to just what colour the Malta Spitfires were painted. 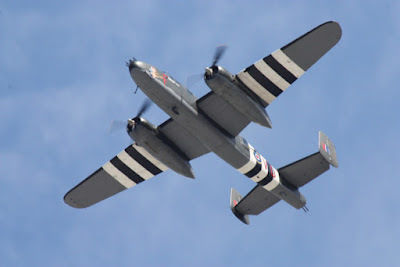 Mr. Shores then discusses Rod's time in the 2nd Tactical Air Force and especially the somewhat disputed account of the first Me-262 shot down by RCAF pilots. 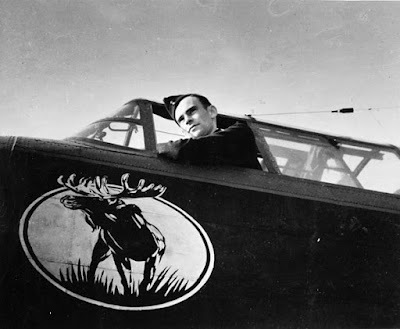 Mr. Shores quotes from Rod's reports of the incident, along with several of his wingmen, which clearly calls into question the claims of Hedley Everard in his autobiography "A Mouse in My Pocket." He finishes the Part One of the book with a short chapter on Mr. Smith's return to Canada and this training as a lawyer. Part Two of the book is Rod's highly entertaining correspondence on air power and the supremacy of the Spitfire. Many letters are quoted including a long running conflict with Rolly Beaumont in Aeroplane Monthly about the positives and negatives of the Hawker Hurricane and Supermarine Spitfire, taking the CBC to task for some TV documentary, and finally some more comments on Mr. Everard and his claim the of single handed shooting down of the ME-262. Clearly this is Rod the lawyer at work, both in writing and his argumentative style! Finally Mr. Shores completes the book in Part Three with a chapter on Rod in retirement and the sad irony of his suicide, Rod and Jerry's Records of Service, and their combat claims. This is a fascinating book and I highly recommend it to all RCAF fans...though Hurricane fans may want to skip Part Two. 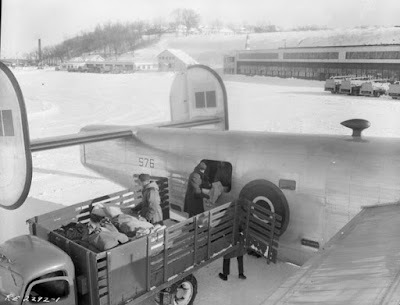 Two shots of Liberator VI(T) RCAF #576 being loaded with mail at Rockliffe. 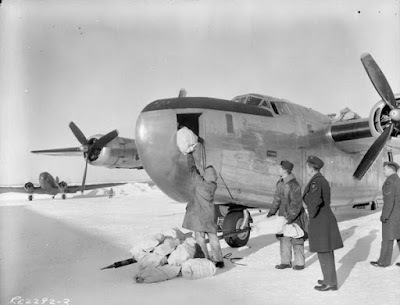 Liberator VI(T) RCAF #570 being serviced out in the cold. 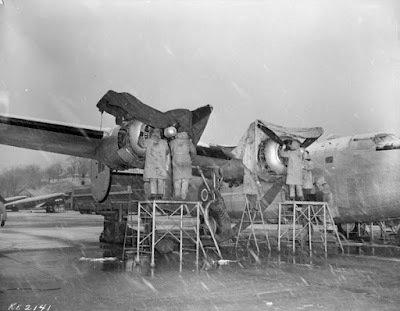 Both of these transport Liberators served with 168 (HT) Squadron. 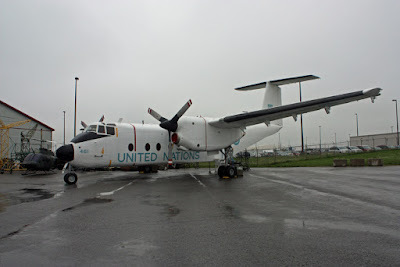 Liberator G.R. Mk. V RCAF #598/Q for Queenie of 10(BR) Squadron from the rear end. This Liberator damaged U-Boat U-845 on February 14, 1944.